Thanks to the invitation of an old friend, two weeks ago I had the great pleasure of a 2 hour dinner with Robin Williams, who IMHO ranks among the greatest comedic actors of my lifetime, alongside Richard Pryor, Woody Allen, Steve Martin, Bill Murray and Gene Wilder. I think I expected to meet someone much more frenetic and, frankly, obnoxious. But Williams is gracious, and listens sincerely to the people around him. He came with his gorgeous fiancé Susan whom he married last week. Williams shared some stories about his career, starting with his high school years studying drama at Juilliard. His big screen break was a cameo on Happy Days as Mork the alien, which later spun off. Perhaps his best known and appreciated film is Good Morning Vietnam. As I enjoyed the Cornish Hen at Jardiniere, we talked about some of his films, like my favorite Dead Poets Society, where he learned from the director that listening can be as expressive as speaking. (My wife has told me the same thing.) It surprised me that Williams cited the creepy One Hour Photo as one of his favorites. He told us a lot about making Awakenings, including the challenge of acting alongside actual mental patients. We also talked about Cadillac Man, The World According to Garp, and Mrs. Doubtfire, which my kids were back home watching at the time. I learned that Williams has gone to Afghanistan three times to perform for the troops, and heard about many other international trips to raise money for charity. He's an active advocate of gay rights, and an atheist, though he was reluctant to say so (there are some things so shocking that even Robin Williams won't say them). 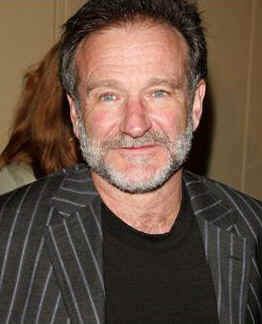 Often Williams broke into character, spinning up hysterical and poignant characters in the middle of conversation. "I'm so hairy," he improvised, " Coco the Gorilla tried to take me out back. She actually signed, Let's you and me go back and get busy."